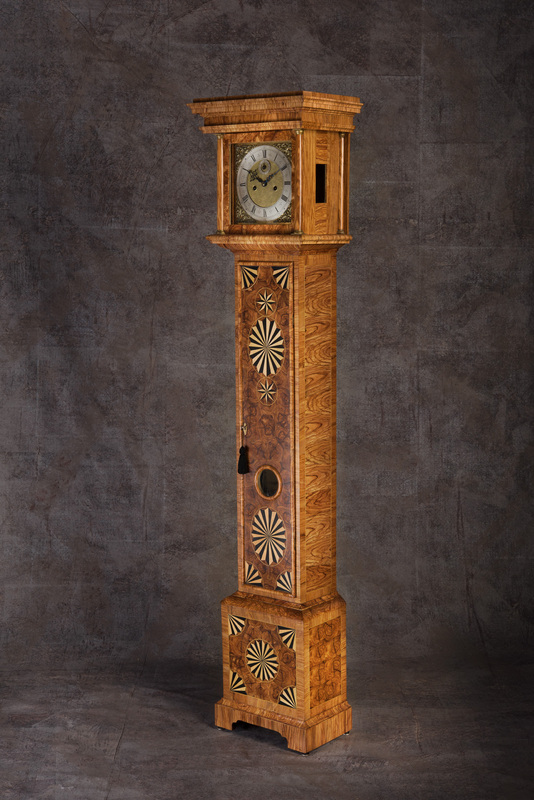 At that time I found a clock dealer in London who made her an offer of $150k to purchase it, but she turned him down. She would rather have the clock than the money. 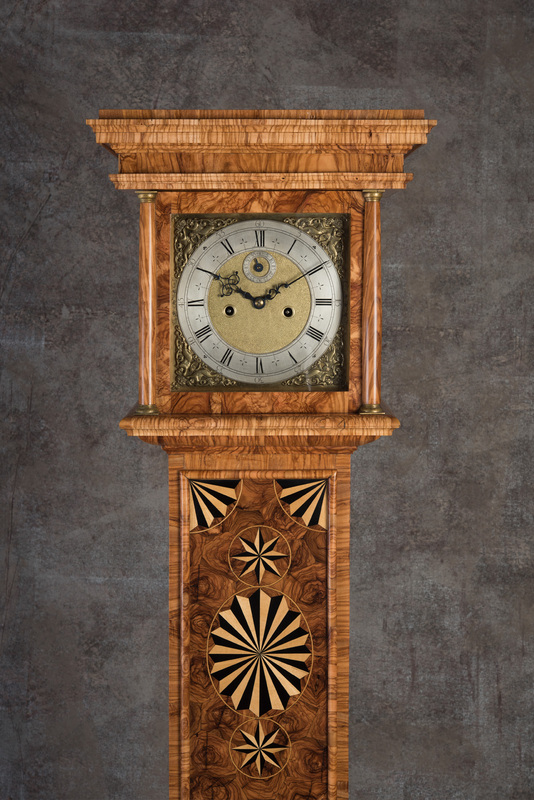 This Windmills clock is interesting and has some dramatic marquetry, using olive oyster frisage decorated with ebony and boxwood pinwheels and fans. Very modern for the time. 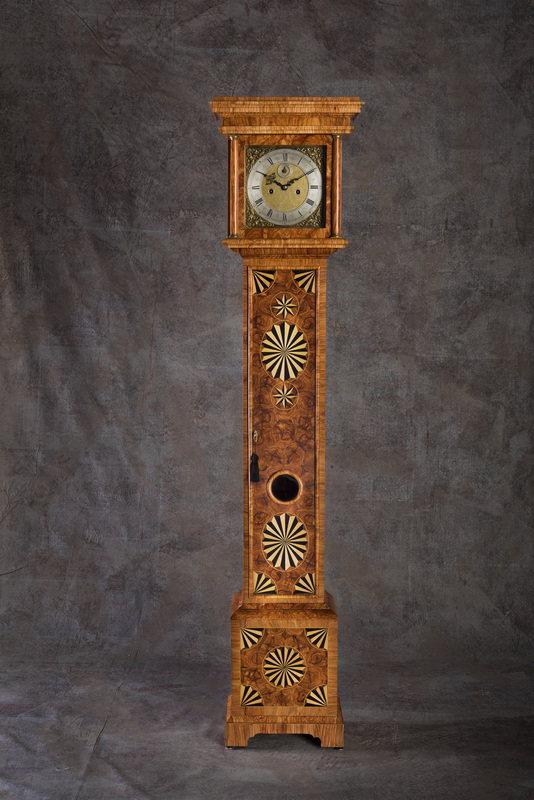 It also has a very narrow body, where most clocks need a 10" swing for the pendulum, this clock only needs 9". 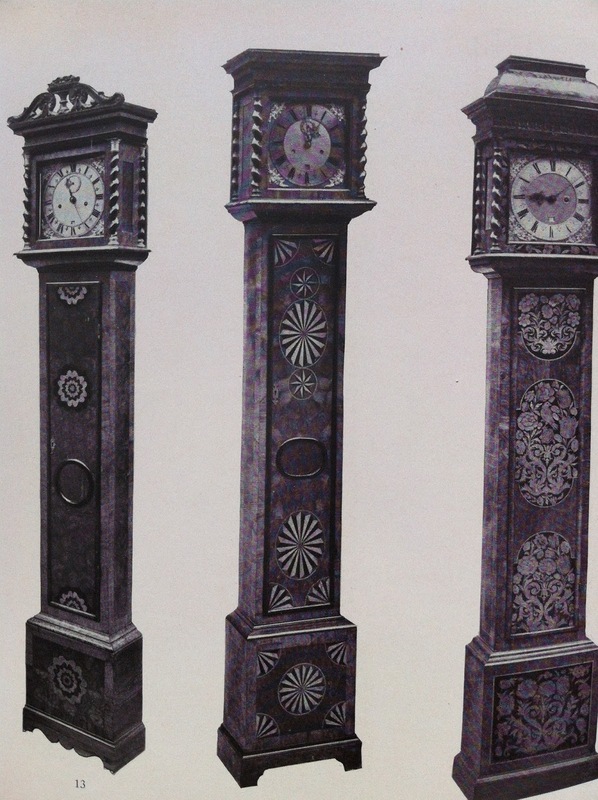 I searched for many months online until I found a period clock works which had the required dimensions. I am having David Lindow make a new period engraved brass face for these works, with my name of course. Unlike the original case, I do not have access to good aged English oak for the carcase, so I am building it out of tulip poplar, which is the best I can get locally. After all, I choose to live in Southern California, so I need to compromise with my wood selection. 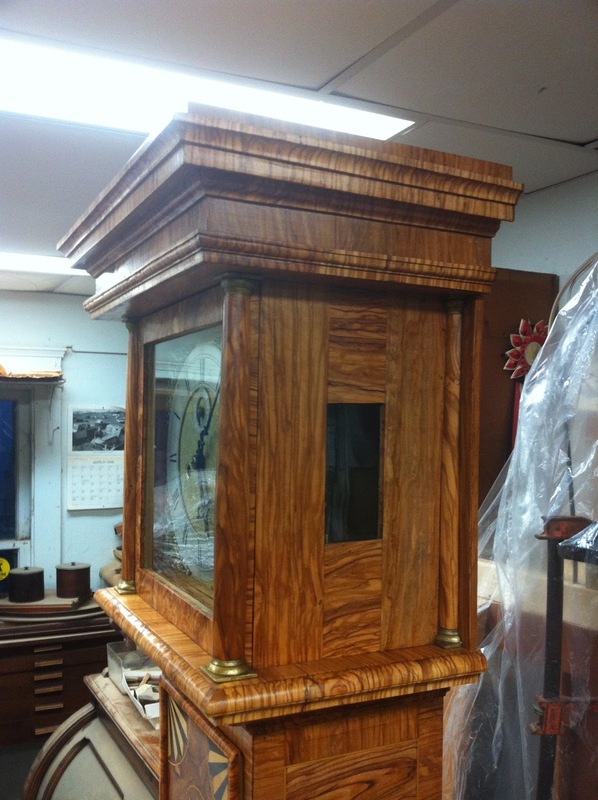 I used to use Honduras mahogany for all my secondary wood carcase construction, but those days are long past. The only real choices I have are beech, oak and poplar. Pine is out of the question due mostly to poor quality. 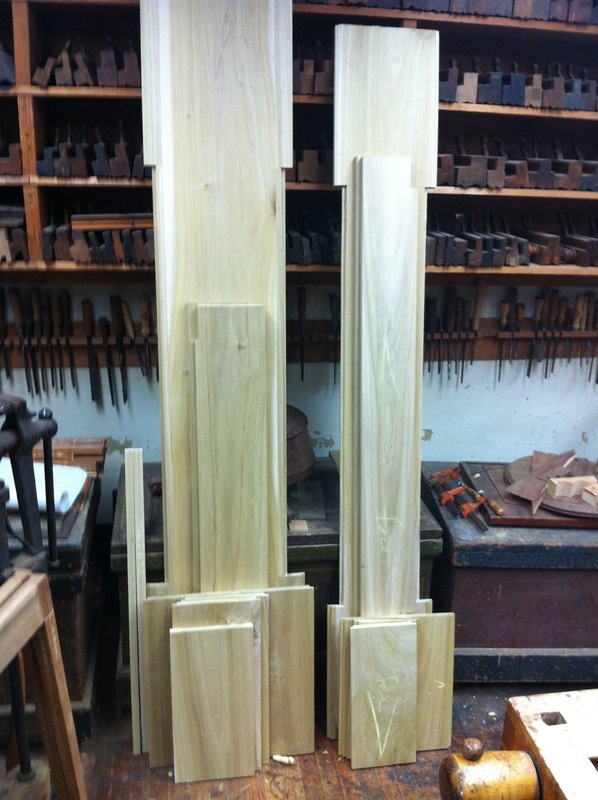 My normal method for making a tall case clock case is to dry fit the pieces together, getting all the joinery right. 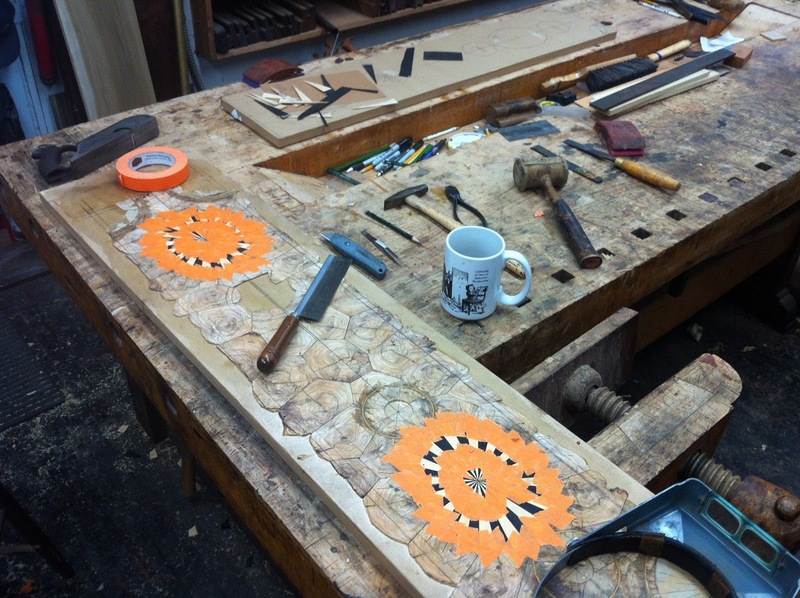 Then I take it apart and press the veneer surfaces on each board, leaving the edge banding off. After the sides and front are glued together I can add the edge banding, covering the corners and edges. Since I am using all sawn material (1.5mm thick) there is plenty of thickness in the veneers to work with. 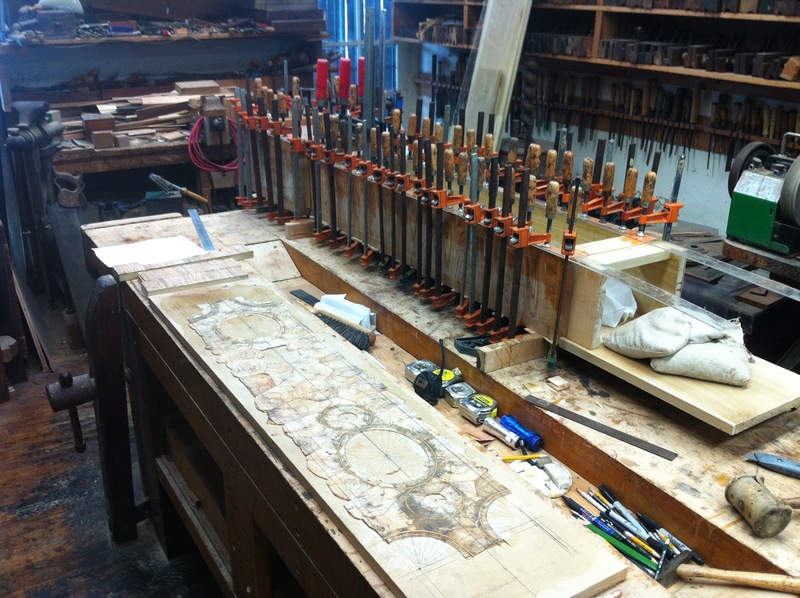 The oysters are purchased from Patrick George, in Paris, and sawn specifically for me. I always get the first choice of his material, and just last month ordered another $3k worth of olive to replace material I have used. 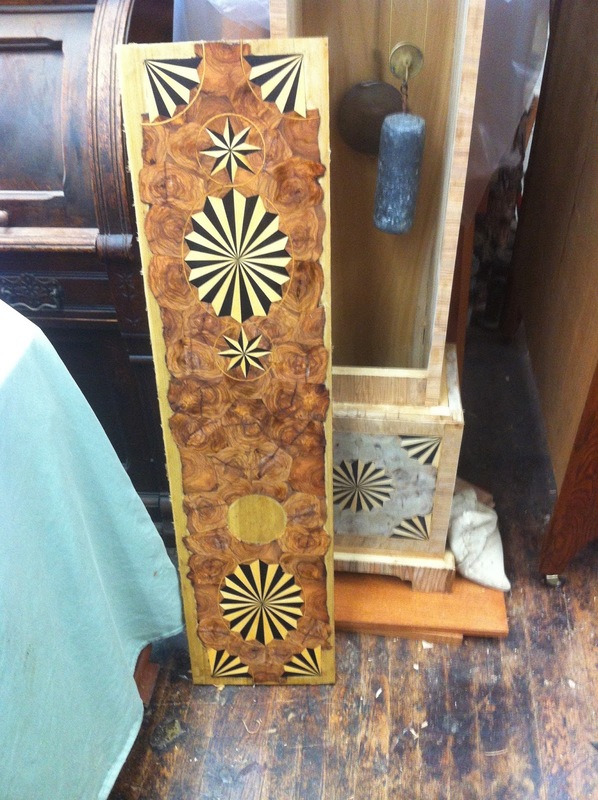 I am designing a William and Mary chest of drawers with olive oyster marquetry for a good client in Dallas and need the best material for that project. 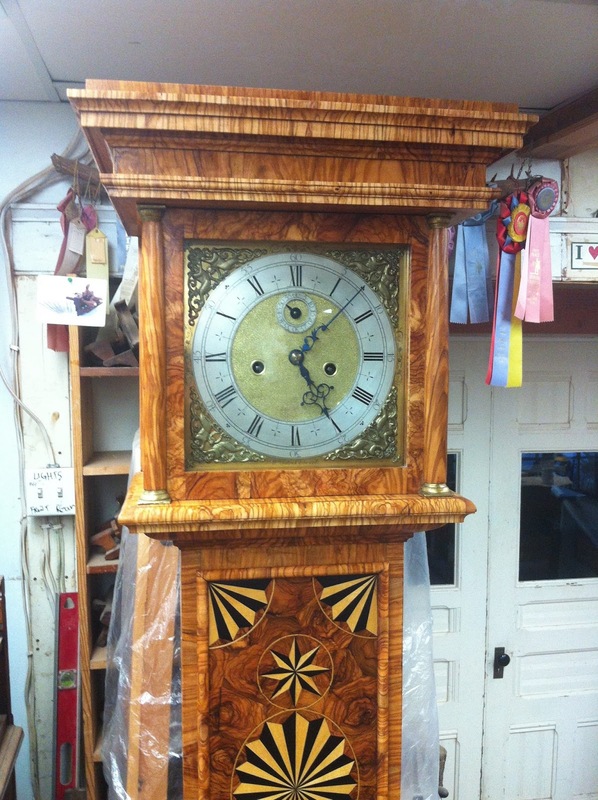 I am proud to say that this same client owns my first clock, a copy of the Tompion clock at the Met in New York. 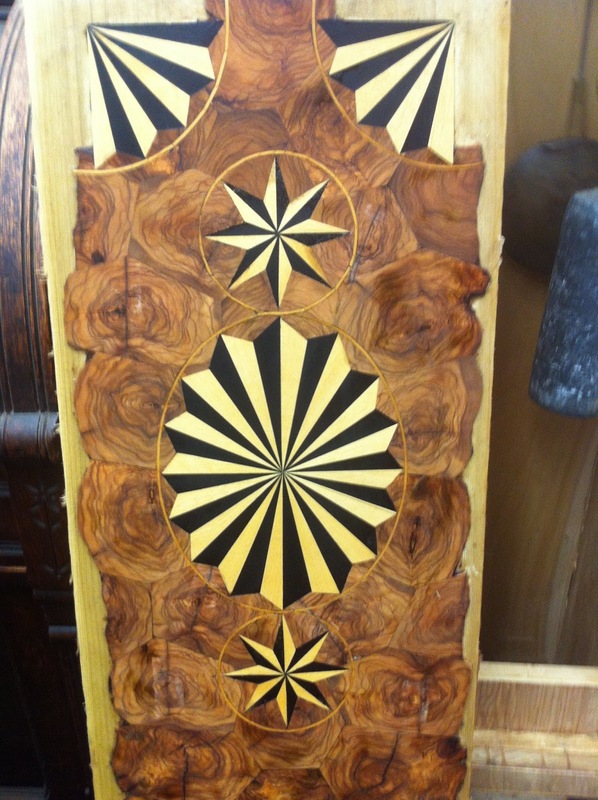 To produce the decoration for the door, I use a standard assembly board process. Stretching Kraft paper over a board and building face down with hot glue lets me put together very complicated patterns with ease. After I put all the oyster pieces down, I added the ebony and boxwood pieces one at a time, carefully trimming each piece to fit with a rabbet plane. 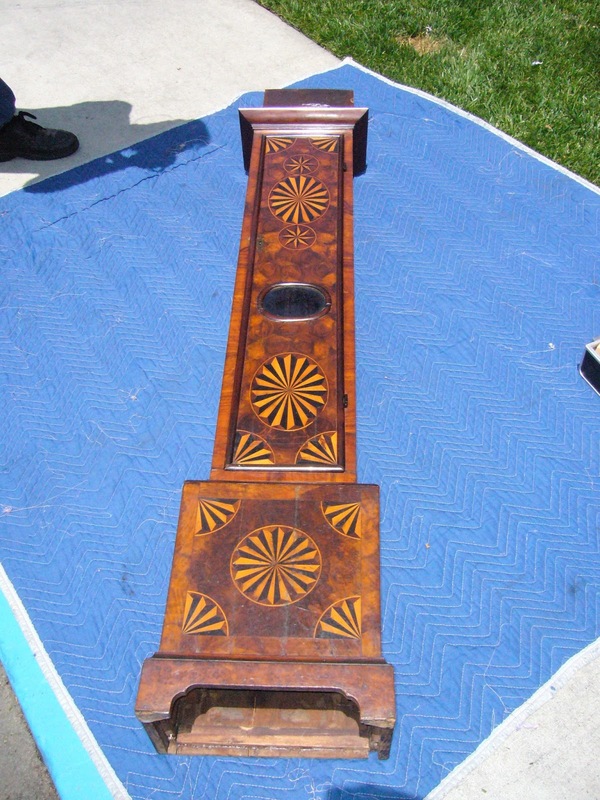 As each element was fitted into its respective cavity on the assembly board, it was held with masking tape. After all the ebony and boxwood pieces were set in place the masking tape was carefully removed, leaving the elements in their position. I then used clear packing tape to hold all the pieces together, trimming around the outside for each design. This method allowed me to lift out the entire assembly, add some hot glue and then quickly place it back in place, clamping briefly. 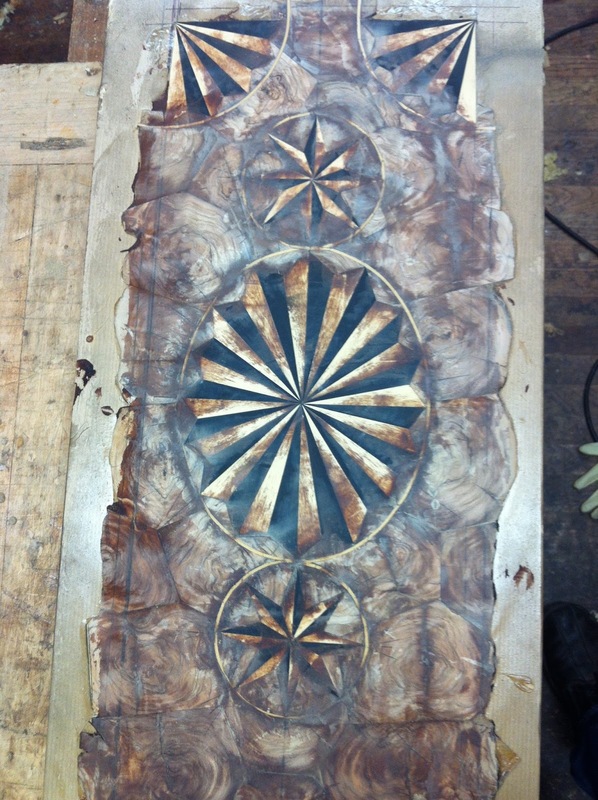 Once all the pieces were put together on the Kraft paper, I applied mastic, as usual, making a paste of hot water, thin glue and Cuban mahogany filtered sawdust. After this was dry, I lightly sanded the surface, cut away the Kraft paper and used Old Brown Glue to apply the entire panel to the substrate. The next day I removed it from the press and used cold water to scrape off the paper and glue from the face. This exposed the final pattern for the first time. The next stage of this project is to build the bonnet and get the face from David Lindow. 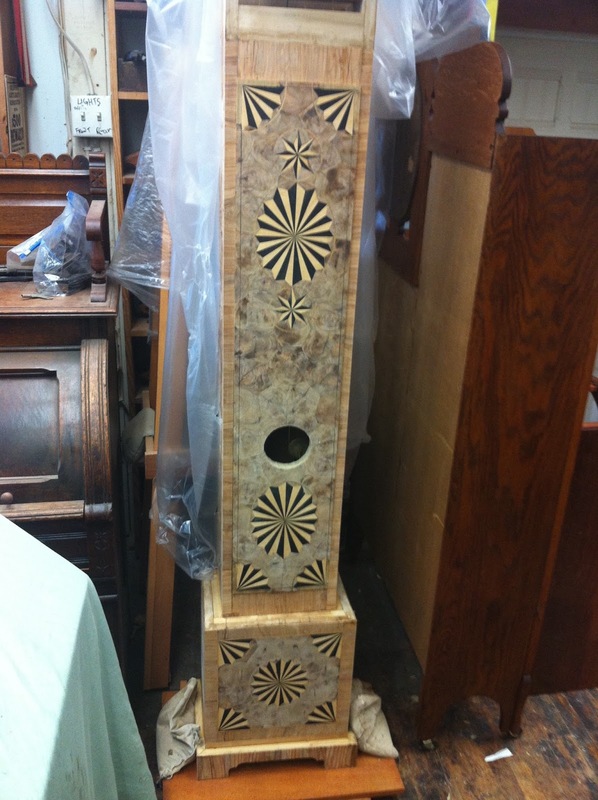 Carve the end grain moulding in solid olive and finish the clock.